You might well be reading this as an office manager or a party organiser scratching your head, wondering how on earth you’re going to entertain your troops at Christmas. Riproar at Pryzm can offer you a two-hour comedy show (with intervals of course!) with some of the best comedians on the UK circuit. Then, after the show has finished. Pryzm will take over and offer you three different rooms of music, including the fantastic Disco One (anthems from the last four decades), five different bars, hostesses, cocktails, private booths and a licence until 4am. We don’t bother with the whole sit-down roast meal thing – Bristol is stuffed full of venues that will offer you this; we’ll settle on some damn fine street food – a turkey and cranberry brioche roll with chips, or the same with a replacement option for the turkey, for the veggies, either of which you can eat from your lap without any fuss. If this sounds like your thing, just order a show+meal ticket for everyone who wants a meal before the show. (We do not offer group discounts). That’s it really. Big laughs followed by an even bigger party… We very much look forward to entertaining you. 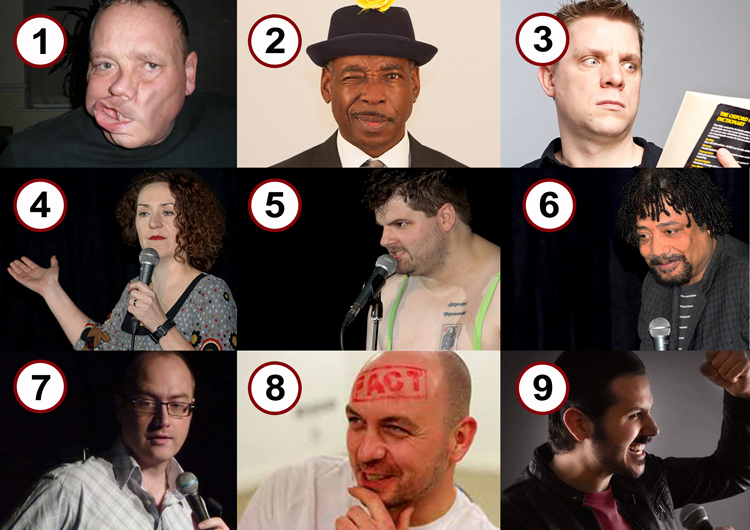 Some of the comics perfoming at our Christmas shows pictured below. Full details with biographies, available by clicking any comedian's picture on our 'Book Now' boxes on the show booking carousel on the home page.